Yahoo's CEO, Marissa Mayer, announced on Tumblr that they have renewed and extended their deal with Microsoft on their search front. 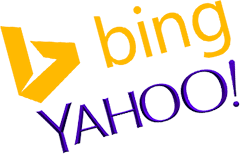 In short, Bing will still power much of Yahoo Search but Yahoo does gain more control. Instead of Bing powering almost all of the ads on Yahoo Search desktop, now Yahoo only has to show Bing Ads on 51% of those searches. Danny Sullivan has an excellent FAQ on the deal. I am not surprised to see the deal renewed, was hoping to hear a hail-marry where Yahoo goes at search alone again, but that was highly doubtful. Today, I’m excited to announce a renewed search alliance with Microsoft. The agreement opens up significant opportunities in our partnership, enabling both partners to improve the search experience, create value for advertisers, and establish ongoing stability for partners. We firmly believe that search is still in its infancy – and this partnership marks the next chapter in our exploration of how to make search truly great. I want to thank Satya Nadella and his team for working closely with us over the past few months to rejuvenate our partnership. Search has, and will continue to be, an incredibly important part of Yahoo, and this new partnership represents a major step forward in our renaissance.